I have read books, posts, and sites all summer reading up on implementing the Daily Five in kindergarten. I have specifically looked for how it works with kindergartners. I plan to share all I have learned with you as I implement it in my classroom this year. 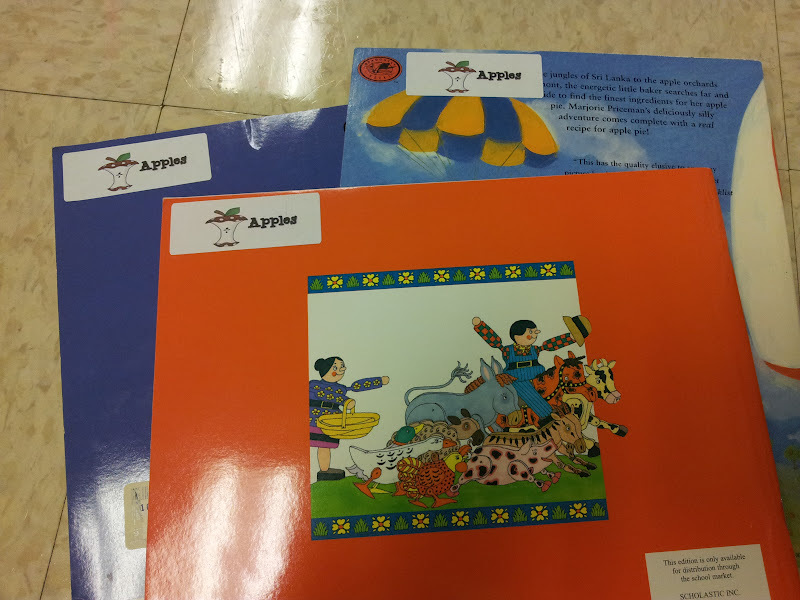 I am going to start with my classroom library and how I have set it up so that my kids can shop for books. 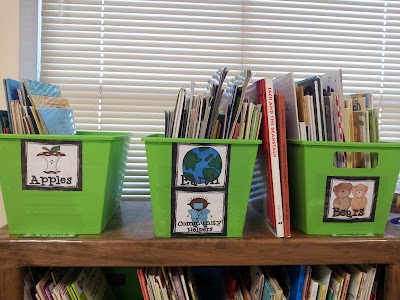 This idea from Erica at Sprinkles to Kindergarten and I used Reagan's Book Bin Labels to label my buckets and books. I sorted all my books my theme or concept. Since I have so many books there were some categories that I had to group together. In cases where I did not have that many books in a theme or concept I grouped them with another theme. That is why the bucket in the middle has two labels. The apple bucket is waiting on another label to be added to it. 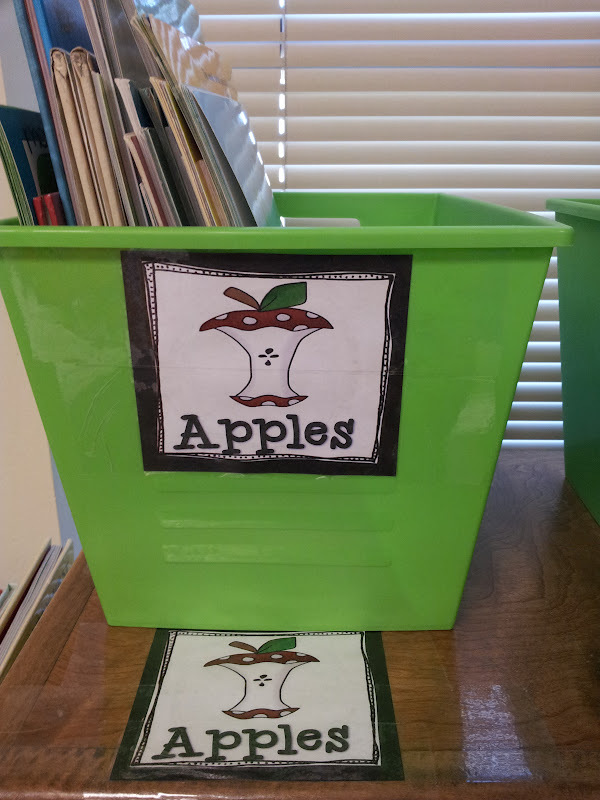 Then I added the same label to the shelf so that my little ones would know where to put the bucket back when they were done shopping. Finally, I labeled all of the books in the bucket with a label to match. One more way of ensuring my little ones get the books back in the right place when returning them to get new ones. 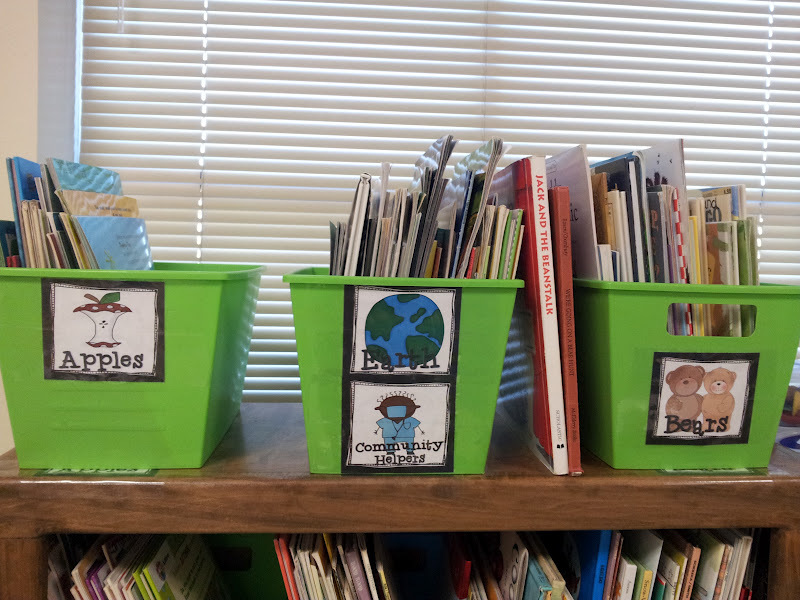 I have categorized and labeled all of my picture books now, but I still need to do the same for my leveled readers. Reagan's unit has labels for leveled readers too and it has been a HUGE time saver to me to have everything already made. April I love it! I can't believe you backed each one with black paper and made the extra too! Fabulous! Thanks for the shout out! Wow! You must have spent an enmorous amount of time on this! It looks great and the labels on the books and the shelf should make less work for you keeping it organized. Love the labels and props to you and Reagan both!! I wish I had this kind of time but with being a first year teacher I think this much labeling will have to wait until next year lol. I'd love for you to come check out my blog though! LOVE your library system! That will be one of THE biggest project for me to tackle also... sigh. check out my giveaway if you have time! Your room looks great! I also purchased the library book labels form Reagan's site and am now working on lableing all my books and gettign them in the right bins! I noticed you put the book label on the back of the book- I was going to put the label at the bottom on the front of the book. Not sure why. Anyway, would you be able to post the directions for your pirate tub? Just wondering! Thanks for everything you post! I wish I could give you some direction on the tub but my friend painted it all and did it at her house and I have no idea about anything she did. I am just super lucky to have her. She makes everything for my room that I need.